Several items taken out of order . . .
Councilor Mercier – Req. State Senator And State Representatives Revisit The State’s Bullying Policy, Chapter 71, Section 370, To Amend The Section Which Does Not Allow The Perpetrators Fate To Be Disclosed To The Victims’ Parents. Public speaker in support of motion. Gives examples of bullying, makes some suggestions. Councilor Mercier says the 2010 anti-bullying law is failing. She says we can have the most beautiful schools imaginable but if children have to fear being bullied the schools are useless. She says she is tired of tip-toeing around the perpetrators and their rights; we have to give the victims more information about what the bully got for punishment. She says that once when her daughter was young, another student used to steal her lunch each day so Councilor Mercier went to the school and confronted the other student herself in the school yard and yelled at her in such a way that the girl never took her daughter’s lunch again. Councilor Cirillo seconds the motion and asks if teachers have any training in how to handle bullying. Mayor Samaras says there are a number of programs and asks if she would like to have someone from the school department make a presentation to the council’s subcommittee on education. Mayor suggests she make a motion to have a presentation before that subcommittee. She makes that motion. Councilor Nuon says at a minimum schools should enforce their existing bullying policies. Just having it on paper is not enough; it has to be enforced. Councilor Milinazzo thanks the Lowell Sun and the Boston Herald for their coverage of this issue. Councilor Elliott says it is unfortunate that a young woman’s life was taken because of bullying. He says it’s important to be constantly vigilant. He’s pleased to learn that teachers have training in spotting and preventing bullying. He says bullying is probably worse now because of texting because that can be another form of bullying. Councilor Kennedy says the 2010 legislation was revised in 2014 because it was seen to be not strong enough. Perhaps it’s time to revisit it again. But besides the state house, it would be good to have a subcommittee either of the council or the school committee to look at the policy now and to see if there is anything that can be done to strengthen that policy. There could be things done locally that could be put in place without waiting for the state legislature to act. Mayor Samaras says he is already talking to the School Committee about creating a Mayor’s Commission on Bullying. Animal Advisory Commission Report – Councilor Elliott, a member of the Commission, asks if other members of the Commission may give a brief report to the councilors. Commission member says ongoing discussions about dog safety. They started with pit bulls but have broadened it out to include all dogs. Initial focus was on disciplinary measures but they realized everything they were doing was reactive. They decided to be more pro-active. They have focused on the most underserved neighborhoods, the Acre and Back Central. They’ve created Lowell Partnership for Pets, funded by a grant, with several local partners. They have a community organizer working with them. They will make services available at low cost, especially things like vet care, spaying/neutering, inexpensive dog food, and a dog behavior hot line. They hope these proactive measures will pre-empt dangerous incidents with dogs. Appoint Helen Littlefield To Pollard Memorial Library Board Of Trustees. Unanimously appointed. Minutes Of Zoning SC January 15th; City Council Meeting January 15th, For Acceptance. AUDITOR BUSINESS – FY19 YTD Budget Report – Councilor Milinazzo asks about the cost of the election exceeding the budget. City Solicitor says the main reason for the added expense was the recount in the Congressional primary. He next asks about the school side of the budget, whether there’s anything that should be of concern. Auditor says everything this fiscal year has been going alright; that the interim CFO of the school department has been very diligent. Councilor Kennedy asks if the members of the school committee are being provided with this report. The Auditor provides the school department portion to the mayor and the school superintendent with copies each quarter. Paris Accord – City’s energy manager says it was a pleasure to respond to this report. She explains what the Paris Accord is, how the United States had made certain commitments pursuant to that agreement (which President Trump subsequently withdrawn from), and how the city had already complied with many of the goals of the Paris Accord through conversion to solar power and other conservation measures. Energy Savings Performance Contract – no discussion on report. CTI Presentation – CTI will do a presentation on youth homelessness at next week’s council meeting. Councilor Mercier says there are many causes of youth homelessness. HCID Parking Judicial Center – Councilor Nuon asks about the section of the report that addresses short-term parking opportunities. Manager Donoghue says there will be ongoing reports on this. DPD employee talks about how existing surface lots that are available for parking in the short-term. Councilor Nuon talks about a small parking facility on Parcel 1, which is a small lot adjacent to the Judicial Center. DPD is drafting an RFP for that parcel from private developers. They envision up to 500 spaces there but it won’t be available until the Judicial Center is completed in early 2020. Councilor Nuon also asks if they are encouraging court employees and jurors to use public transportation to get to work. DPD says yes. Councilor Nuon asks if the delay in the city’s big garage is expected to cause delays for the Judicial Center or the rest of the Hamilton Canal District. DPD doesn’t think there will be any collateral delays. Councilor Mercier says she is very concerned about the delay in the 900 space parking garage. Manager says the judicial center won’t be completed until sometime during 2020 because the company making chilling units for the building went out of business and they are finding another supplier. Councilor Mercier criticizes the portion of the proposal that suggests satellite parking at Cawley Stadium with a shuttle bus. She says the people of Belvidere didn’t want the high school at Cawley so why should it now be OK to park cars and have shuttle buses there. Councilor Mercier then says she was surprised the vacant lot across Middlesex Street from the Judicial Center is owned by the Charter School and that they don’t pay taxes. But she says if the charter school starts allowing people from the judicial center to park there and charge them for it, the city should begin taxing the charter school for that lot. Councilor Elliott is encouraged by the news the city is pursuing a private developer to build a parking garage next to the Judicial Center. Manager Donoghue says this has been ongoing on a daily basis and the council will be updated continuously. Councilor Milinazzo asks about the Winn apartment development and whether it has any onsite parking. They are not. They looked at it but the terrain there doesn’t permit an underground garage. Winn does have an agreement with the city to provide 200 parking spaces for the Winn apartments. Councilor Milinazzo then brings up the possibility that changing technology will diminish the need for parking garages through the use of driverless cars and some say this could happen within 10 years. Manager Donoghue says that is a definite possibility that we would have to adapt to, but until we get there we have to plan for today. LHS Project Update – Perkins Eastman and Skanska give a presentation on where the high school project is at. Next step is cost estimation which should come before the council in February in a vote that would authorize the city to present the cost estimates to MSBA which would get the city on the MSBA agenda for April 10. Architects have had numerous meetings with entities and people in the city. Goes through timeline. Emphasizes that we should think of this as a series of smaller projects within the large project since students will be occupying new spaces prior to the final completion date. They expect having a construction manager on board by this May and a contract executed by June. The MSBA has approved the plan for the use of the interior space. The design achieves all of the objectives of the Education Plan. The exterior plan will create and emphasize outdoor spaces. Also, the entrance will be able to accommodate the mass of students who arrive and depart from the school everyday. Councilor Mercier asks how high is the freshmen academy? 5 stories. She asks what is the square footage for the project? 620,000 square feet. She asks about the cost to refurbish per square foot versus the cost of square foot for new construction. She asks if the cost of brand new is less expensive than refurbishment. Answer is it depends. Councilor Mercier says she’s nervous about the cost of this, comparing it to the cost of Waltham. Consultants explain that Waltham is a vocational high school and so it is more expensive. Consultant also says you can’t make a blanket statement about refurbishment. For example, the 1922 building will just have repointed bricks and new windows whereas the 1980 building will be stripped down to the steel. Both are renovations but the cost of each is vastly different. Councilor Mercier says she is sad about the dentist office. Councilor Leahy asks about the cost and timing of replacing the 1922 building. Consultant says the work being done on that roof now will remain in place. The new rooftop equipment will be coordinated and cut into that new roofing. They do expect to replace the rubber membrane but that depends on the warranty that comes with the new rubber membrane. However, they are factoring in the cost of a new rubber membrane just in case. Resolution – City Council Support Massachusetts Senate Docket 101, The Education Promise Act – passes 9 to 0. REPORTS (SUB/COMMITTEE, IF ANY) – Environmental Subcommittee report on meeting earlier tonight on Merrimack River flooding and the need for a water level gauge, where to place it. PETITIONS – David St. Hilaire, Jr. Request Amendment Of City Ordinances To Allow Residents To Keep Miniature Pigs As Pets. Councilor Mercier says she has heard that pigs are very clean and make good pets so she refers this to the Animal Control Commission. Councilor Kennedy recalls the debate on backyard chickens several years ago included one person who had a pet pig named Bacon who wanted to include pigs in the modified ordinance. Councilor Conway – Req. City Council Solicit The Opinion, Through A Ballot Question, Of The Voters Of The City Of Lowell On Whether They Want To Maintain The City Of Lowell’s Present Municipal Election Representation Or Direct The City To Develop A New Municipal Election Representation For The City. Mayor asks City Solicitor for an opinion of whether it is appropriate to discuss this in open session. Solicitor rules that this is a matter that is currently pending in Executive Session and therefore it should be discussed in the Executive Session by the entire council and not in the public session. Councilor Conway says he disagrees with the ruling. Mayor asks for a motion to refer this to the Executive Session. Councilor Mercier says she doesn’t have a problem discussing it. Solicitor says there’s a difference between an individual councilor making a comment to the newspaper and taking up a matter in a public meeting and deliberating on it makes it a different situation. Councilor Milinazzo moves that it be referred to the executive session. Councilor Kennedy says that this belongs in executive session. Council votes unanimously to refer this motion to the executive session. Councilor Cirillo – Req. City Mgr. Work With The LRTA To Incorporate A Courtesy Button Program Which Will Provide Buttons For Our Elderly, Disabled And Pregnant Riders, To Allow Them To Have Priority Seating On The Bus. Councilor Cirillo explains the purpose of her motion. Councilor Mercier gives a number of reasons why she does not think the motion is necessary. She says she checked with the LRTA and the people there are not too happy with this motion. Councilor Cirillo – Req. City Mgr. Have The Proper Department Review The, “Age Friendly Boston Action Plan 2017” And Provide A Report To The City Council As To Preparing An “Elderly Friendly Lowell Action Plan” For Achieving A More Elderly-Friendly Lowell. Councilor Cirillo says she knows we have programs for the elderly but Boston has a massive action plan [she holds it up] that will implement 75 action items to make Boston more elderly-friendly. She thinks Lowell should do something similar and come up with an action plan for the elderly in the city. Mayor Samaras suggests it be referred to the council’s elderly affairs subcommittee. Councilor Leahy – Req. City Mgr. Report To City Council Regarding A Plan To Reorganize The DPW And The Parks Department. Councilor Leahy says now that there have been new leadership people hired, he’d like the City Manager to ask everyone their opinion and then reorganize the department as needed. He says what’s happening over there now is not working. Hopefully this will give us a total restructure. Incorporate some benchmarks so that if people aren’t happy working there they will be written up and move along to new employment. Mayor Samaras – Req. City Mgr. Have Proper Department Look Into The Installation Of A Bus Shelter At The LRTA Stop On Broadway Street Near The Lowell Senior Center. Approved. 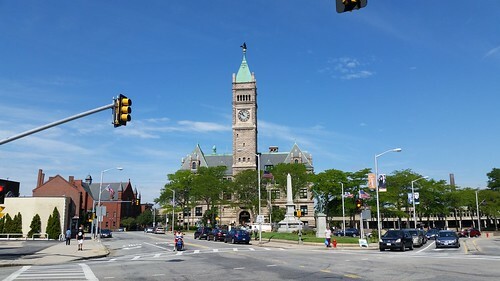 CITY COUNCIL – EXECUTIVE SESSION – Regarding Matter Of Litigation, Namely Huot Et Al V. City Of Lowell, Public Discussion Of Which Could Have A Detrimental Effect On The City’s Position.